Home Entertainment Food Pork-Barrel Spending Bill Leaves Egg On The Face Of Congress! Pork-Barrel Spending Bill Leaves Egg On The Face Of Congress! Normally I send bacon to friends, associates, clients and people that I truly like and care about. What’s most interesting in this story is bacon was sent to a politician as an angry protest to what the citizen viewed as a case of pig-headed pork-barrel spending. 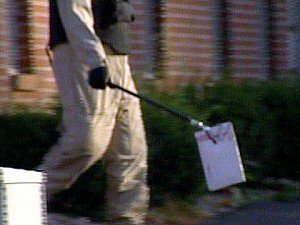 So it came to be that Congressman John Boehner’s Westchester, Ohio office was evacuated the Monday afternoon of October 6 after a suspicious package was delivered. It seems this mysterious package appeared to be leaking an oily substance and so office staffers called the Capitol police in Washington D.C. as a precaution. The Capitol police advised the staff to immediately evacuate the building and ten they called in the local bomb squad to handle the situation with professional care. It wasn’t long before rumors of bomb threats quickly spread throughout the neighborhood as police cars and other emergency vehicles began to fill the streets. 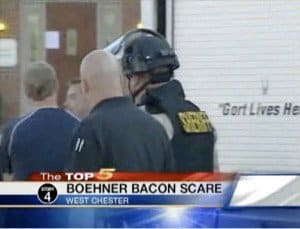 However the Congressman’s office staff ended up with a serious case of “egg on the face,” when an X-ray analysis performed by bomb squad, investigators determined that the package contained … BACON! 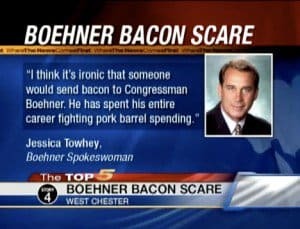 It seems and angry constituent thought it would be most appropriate to send a box of bacon to Representative Boehner’s office as an angry protest to his recent “yes” vote on President Bush’s $700 billion financial industry bailout plan. Man, I sure hope that in the future, everyone I ever tick off in life will be so mad at me that they’ll feel compelled to send me a box of bacon. Who knew being made to feel guilty could be so yummy!